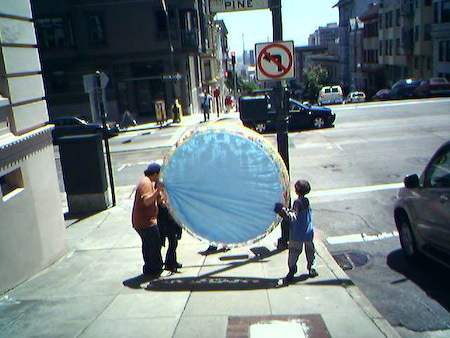 The GPS Adventure was a day-long city navigation game involving hotspot hunting via GPS coordinates in San Francisco. Players hiked through some of the city’s most colorful neighborhoods to find clues and ‘travel aids’ at corner stores and community centers, traversing Civic Center, Nob Hill, the Theatre District, the Tenderloin, and Chinatown (where a well-deserved feast was consumed). While taking the form of a game, the Adventure provided a framework for the mingling of class, race, work and play, creating a spectacle that subverted the daily routine of San Francisco.